Well, I knew that was inevitable. This week I hit that horrible, ugly stage known as “Overwhelmed”. I glimpsed at it the first week when I went through the entirety of my clothes in a single day. There was simply so much to sort. And handling each item carefully, individually, made that feeling both better and worse. Last week was the kitchen (or most of it) and I did too much at one time. I wore myself out and typical to being me, I kept pushing past that worn feeling when I should have stopped at first warning sign. This weekend all I can think about is how much I need to rest and how much there is in the house I haven’t even glimpsed at. How long is this insane project going to take me? I had no illusions I’d have it done in just a couple of weeks, but I’m hitting the dark place where it seems like too much to accomplish. 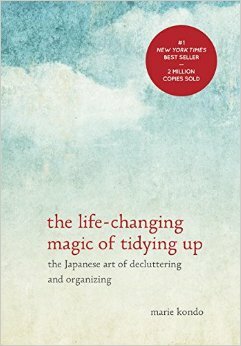 One of the things that stuck with me in reading “The Life-Changing Magic of Tidying Up: the Japanese Art of Decluttering and Organizing” was the sense of not giving up. You may not be able to tackle the project with consistent intensity, but you can not give up. I just imagine Marie standing in my house telling me “Ganbatte!” You can do it. On top of the depression this week, there’s the physical fatigue. I did far too much in the house last weekend and then went straight back to my 40-hours of work for the week. I don’t have a particularly physical job. I’m an insurance agent. But when I hit that point, just sitting up, answering calls, and not being able to rest is all it takes to pull me further under. I have a chronic autoimmune disease, and really, I’m one of the lucky ones. It’s well-managed. Most days I live a pretty normal life. But when a flare hits, it hits, regardless of what I am in the middle of or what my plans may be. I needed to take this weekend to do as little as possible. To rest. Yet Marie was still there in my head, gently saying “Ganbatte!” So I took about 30 minutes one evening, got up, and emptied out all of my makeup and toiletries and tossed every single item I don’t use or was out of date. I got rid of about 35-40% of these items. What’s left over is organized and easy to find. In fact, there is even a comfortable amount of space available for any new things we may acquire. You may be asking where this fits in the KonMari method. I’m still under Category Four: Komono (Miscellaneous). Number 2 on the list is skin care products and number 3 is makeup. We can mark those things as done. I might be skipping around a bit, but I am doing my best to follow through with category sorting. This weekend I needed a tiny and very manageable project, and this was about the smallest I could think of. I’m ending this week on a high note though! 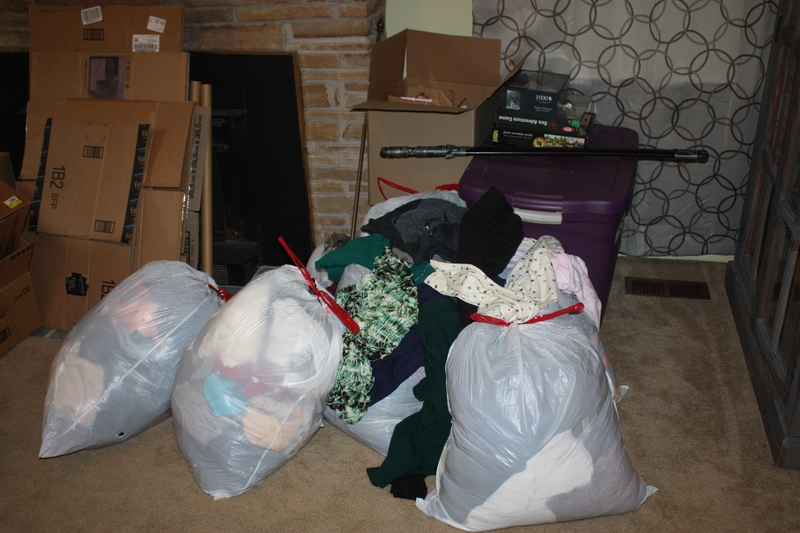 Look at all the things I have set aside for the garage sale so far! And honestly I have discarded even more, because this doesn’t include all of things that ended up in the trash can, like old tupperware and expired shampoo. Two weeks’ worth of work. I am pleased by this. – I feel disappointed in myself and down, but I’m being too hard on myself and I know it. I can’t help those emotions. – I feel overwhelmed and honestly this was to be expected, I just have to remind myself that overwhelmed does not mean I give up. – I’m still making progress… even if only by small increments. Lissa, I have fibromyalgia and that same drive to get things done. Don’t beat yourself up. I had a similar experience where I pushed through to finish a project by June 25. This meant working right up to bedtime several days in a row. Needless to say, I suffered for it. Kicking myself for pushing too hard but glad I finished. Hi Barbara! I’m so sorry to hear about fibro. I can’t even imagine that side of things. I know it is difficult. I am sending you gentle hugs. It’s an odd balance, isn’t it? Trying to put forth the extra energy to complete something, knowing you’ll be pleased with the results, but knowing your body could very well kick back at you for it too. I miss the days when extra work just made me look forward to bedtime more! We just have to learn the happy medium of tackling the projects we want and listening to our bodies at the same time.